The State University of New York at Fredonia auctioned a painting Tuesday by Georgian artist Niko Pirosmani through Sotheby's in London for $2.84 million. It was part of a collection commemorating early 20th-century Austrian writer Stefan Zweig that contains thousands of his artifacts, including letters, manuscripts, photographs and ephemera. The proceeds due to Fredonia — around $2 million — will be used to create an endowment to "preserve, digitize and publicize" the collection as well as to support the Archives and Special Collections at the college's Reed Library, where the collection is housed, according to a university press release. 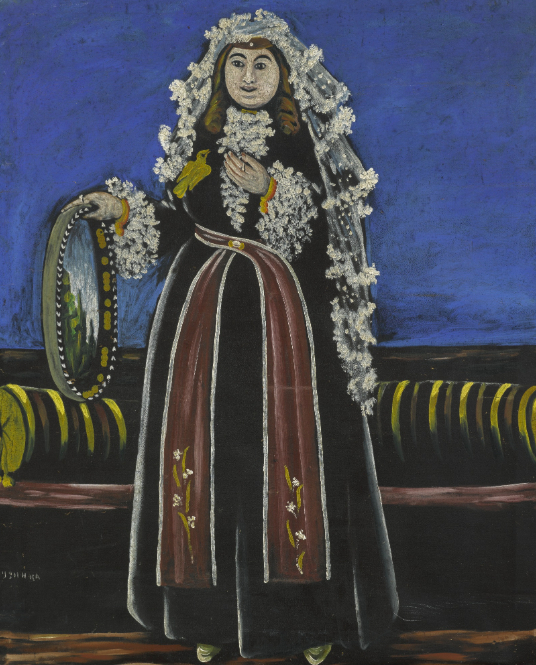 A donor gifted the painting, "Georgian Woman Wearing a Lechaki," to the the university in 1981. In its statement, Fredonia said it lacked the "means to display, preserve, and secure" the piece. An English professor at SUNY Fredonia told Inside Higher Ed that his students often study the collection, and that he is concerned the single-item sale will go to a private party, effectively cutting off access to it. He fears if the institution starts selling individual collection pieces, it will be "erasing that archive." In its statement, the university said selling the painting would help it maintain the Zweig's literary archive, though it did not disclose the painting's buyer. Similar sales of artwork by universities to fund programs or boost revenues have met resistance on campuses and received complaints from organizations representing art and academic museums. La Salle University, for example, announced in January plans to sell 46 pieces of art from its museum collection that were projected to bring in more than $7 million, according to the Philadelphia Inquirer. The sale, which was criticized by members of the art community, was initiated to help the struggling university make up a budget deficit that was partially due to an enrollment decline. Those groups also opposed the 2014 sale of a painting by American artist George Bellows by Randolph College, which used the proceeds to shore up the college's endowment. The painting sold for $25.5 million to the National Gallery in London. And at Brandeis University, officials announced plans to sell its art collection to boost its diminished endowment after the 2008 financial crisis, only to reverse course in a settlement after supporters took legal action. "Georgian Woman Wearing a Lechaki"
To launch a scholarship program, Bennington College in Vermont announced it will sell art from its collection, including a painting by alum Helen Frankenthaler, which alone is worth $3 million to $5 million. Unlike the other institutions, many of the artworks were donated to the college with an expectation that they would eventually be sold, and Bennington hopes the scholarship encourages people to donate more art to the college. Along with using artwork as a way to raise revenue, many institutions are finding traditional fundraising an increasingly important part of their income. In some cases, fundraisers have blown past their university's goals and set new records. Harvard, for instance, raised $9.6 billion in five years, which it intends to use for endowed professorships, financial aid and research programs. But with enrollment down and funds tight, some smaller institutions hope to bolster their budgets with smaller campaigns. St. John's College, which has campuses in Maryland and New Mexico, wants to raise $300 million in a campaign to offset tuition cuts, while Sweet Briar College used an aggressive fundraising campaign that brought in $18.4 million and helped keep its doors open.